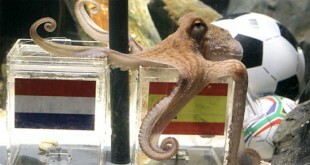 Paul the Octopus, whose predictive powers during the 2009 Euros and the 2010 World Cup led to worldwide fame, was found dead this morning in his tank at the Sea Life Aquarium in Oberhausen, Germany. The soothsaying cephalopod was 2½ years old. 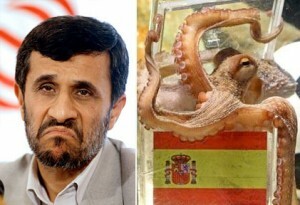 Iranian President Mahmoud Ahmadinejad accused Paul of spreading "western propaganda and superstition." Equipped with nine brains, eight limbs and three hearts, Paul’s predictive powers first came to notice in the during Euro 2008. By the time of the quarterfinals of the 2010 World Cup, the oracle octopus was world famous for his 9–1 record in predicting the results of of Germany’s matches, his only misstep occurring when he predicted that Germany would beat Spain in the Euros. With Germany again facing Spain in the World Cup semifinals, Paul’s prediction that Spain would win to advance to the finals resulted in death threats from German fans. Paul then went on to correctly pick Spain to win over the Netherlands, finishing a perfect World Cup record. Despite such success, controversy still followed the octopus. Paul will be cremated later this week. A memorial ceremony will follow. Dear Sirs and Madames: PAUL will be forever in our hearts. PAUL is an example of millions of helpless animals that have been killed every day in the name of world famine and profit. Animals give birth, eat, feel, and die like we do. Animals are GOD’s creature. PAUL was sent by God to show people Animals have a soul. Human beings feel superior to animals. ANIMALS ARE SUPERIOR TO US! WE WILL FOREVER MISS YOU PAUL. He lived 6 months longer than his expected 2 year life expectancy. Sounds like he lived a good, long life.